To give you an idea of how often Diamond Head is flyable, the last time I got to enjoy it, I flew with Johan, Ike, and Alex - while Jetflap was helping on launch mending from a broken back & wrist. And I fly often - at least on the east side – only sailing and business trips get in the way. When I checked Sandy's Monday morning it was due south and Alex's earlier post "...the guys will be watching to see enough S for DH (10+mph)." was gnawing on my mind. I arrived at Gardens at 11 am and it was perfectly straight in so I got out the phone and started calling. Only problem was I had a new phone w/ only two PG's in the directory – One-Eye and RT. I called Jim, knowing he was on the mainland, so he could call others but I got his recording. I called Ryan knowing he would probably be with Reaper and they could let everyone know. He was, fortunately, just down the street prepping to surf Waikiki. He promptly posted a notice to Windlines and headed over. It was tough, but I waited for him since he wasn't too sure of the location. To let you know how good it was, you could launch from the edge without someone holding your wing up – the wind was blowing that good. He went straight up and I followed. It was so strange flying the "Crown Jewel" again that I felt like I was doing something illegal and kept waiting for the keystones to pay a visit. The tourists were definitely in awe, as Ryan thrilled them with low passes, SAT's and wingovers. I kept looking down to the parking lot waiting for pilots to arrive. Fireman was first and launched with gear I had never seen before – no wonder, it was always in California with his then girlfriend, now bride – a bright orange wing with a very minimal harness and an even more minimal helmet. He joined us for a while and I landed at the LZ which is perfect now – the lower part is still cluttered with small brush but the top part is nice and clear. Ryan landed soon after at the LZ and we headed over to Gardens to assist newly arrived pilots on their take off. Too late! The window was closed and Fireman bombed out on the beach – game over. That's why it is the "Crown Jewel" - you can't fly it often, and usually the flying window is very short. Just look at the wind numbers from HNL airport that morning: 09:53 S 7mph; 10:53 S 12mph; 11:53 S 14mph; 12:53 S 12mph; 13:53 S 9mph. So only from 11:00 to around 13:30, the "Crown Jewel" was open for business. And y'know... I haven't been back since that day when it was flyable. I'm either stuck working, or on my way there when I get the call that the party's over. Hopefully that wasn't this season's last shot at the Crown Jewel! Thanks for sharing your happy day with the rest of us, Frank. Grrrr! 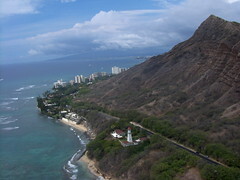 Diamond Head is certainly a rare gem of Hawaii ridge soaring. I remember my first time, and pretty much every subsequent time - every one slightly different: from the unwanted attention of our friends at HPD, DLNR, and Coast Guard MPs, to spinning topcrashes, tree crashes, watery surf landings, and even an official permission from ATC to exceed 1000 feet ASL one time. I was talking to Reaper about it yesterday as we were racing out there (before Rich called us to let us know the window was closed), and we agreed that we don't consider DH a suitable site for P2 pilots. I know our newer pilots will be disappointed to hear it, but I think most of our pilots will agree that the launches and toplandings there are quite technically demanding, especially in light of the overgrowth of the Keawe in recent years and the use of the garden launch. No matter what, it's definitely worth making the time to come out there on those moderate South days to see what the fuss is all about. It's always a party, and there is always plenty of eye candy for pilots of every persuasion. Yeah Jeff, that was it - I remember it now - you were surfing. You called that morning Alex. It was the only reason I was there. I agree regarding P-2's. I remember how daunting it looked to me as a P-2 with all LZ's basically running perpindicular to the wind. I was there that day too. What was I flying? Hell I can't remember. I 'do' remember how stoked Johan was to finally fly there. That's a very special day for a new pilot to finally fly Diamond Head. I agree with Alex, that this place is no P-2 site.